The Astaxanthin Platinum product reduces the lactic acid in your body the culprit that causes post-workout soreness. It may protect your muscles from damage, support eye health, and protect your skin from UVA and UVB rays. It is made out of the of the most powerful antioxidant which science showed us that it is 550 times stronger than vitamin E. It also reduces the free radical damage done to your muscles. I recommend you use this product with the MAP Amino Acid pills. Do you want to order this product? 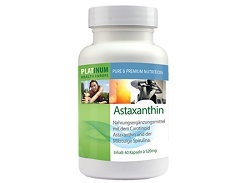 Select “view product” Astaxanthin, 60 Caps (Product Code: 3537e) from the list inside the Platinum store. Download brochure for the Astaxanthin and other products from Platinum.